Preheat the oven to 350°F and line a large cookie sheet with aluminum foil. Using a sharp knife, slice the top 1/3 of the pumpkin off creating a lid. With a spoon, scrape out the seeds and pulp of each pumpkin. Discard seeds and pulp. Place each hollowed out pumpkin on the prepared baking sheet. In a large pan, add the olive oil and sautee the onion for a couple minutes or until soft. Add the meat and brown until done. Drain. Add the soy sauce, brown sugar, mushrooms, and cream of chicken soup. Simmer for 3-4 minutes. Add the cooked rice and the water chestnuts and stir to combine. Pour about 1/2 cup of the casserole mixture into each hollowed out pumpkin. Place the lid on and bake for about 30 minutes. Serve. Pumpkins aren’t just for carving and adorning your doorstep anymore. Try this for an autumn family dinner or Thanksgiving! Although I usually use miniature pumpkins around my house as inexpensive fall décor, they also happened to be the perfect size to transform into individual serving dishes. I like to use them as serving bowls for a delicious and savory casserole. These Roasted Mini Pumpkin Bowl Casseroles can be served as a hearty appetizer or a meal depending on what size your pumpkins are. The casserole filling comes together quickly in one pot then is poured into each hollowed out pumpkin and baked with the lid on until warm and bubbly. You can actually eat the entire pumpkin itself if you bake the pumpkins just a little bit longer. No dishes here! 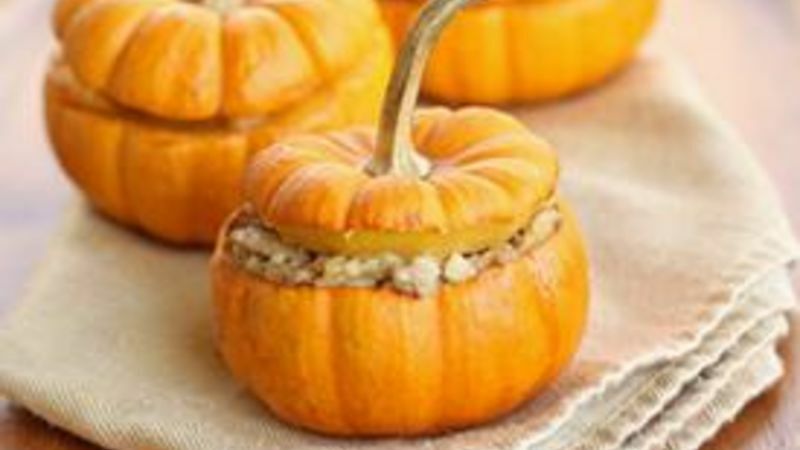 Serve one miniature pumpkin to each guest and they'll be amazed at how creative you are! When they take off the lid, they can dig into a creamy and comforting casserole. What a great tradition to serve these casserole filled miniature pumpkins every fall.